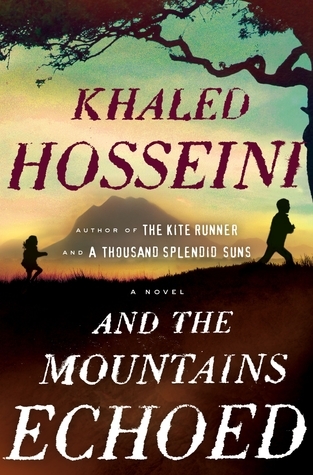 There are a handful of writers who have a place in my default folder of “People Whose Stuff I’ll Always Read.” Khaled Hosseini is one of them. When I read The Kite Runner, sometime in 2005 or 2006, my first thought was that the book should be required reading for all high school seniors. (The subsequent film in 2007 was equally gripping.) Then came A Thousand Splendid Suns and it had the same jarring effect. Hosseini’s stories are the closest I’ve ever gotten to the Afghan people and twice I’d been left wanting to know more, to meet the characters, to better understand them. I just finished And the Mountains Echoed and I’m there all over again. The novel is like a woven set of short stories. We hear from five main characters who are all interconnected, and we are privy to their point of view depending on what part of the story we’re in. Starting in the fall of 1952, Abdullah, 10, and his sister Pari, 3, embark on a two-day journey with their father and neither child knows where they’re headed. As it turns out, Pari is being given away to Nila, a woman in Kabul who cannot bear children, a most difficult decision from which Abdullah never recovers and his father never speaks of it. Old enough to know what has happened, he spends the rest of his life missing his sister. He and his wife name their daughter Pari in her honor. Then there’s Nabi, Abdullah’s uncle and the one who arranged the adoption. He works for a wealthy but private Afghan man whose petty wife all but asks for some bargain to be made. Nabi is the one who hands Pari over Nila and suffers the guilt of bearing such a secret throughout his life. Nila takes the child and heads to Paris, leaving behind her husband and his caregiver. Dr. Markos, a Greek physician who lives in Kabul, becomes Nabi’s confessor. In a deathbed letter, Nabi tells Dr. Markos where to find Pari (living in France with her Afghan-Parisian mother) and also where to find Abdullah, now living in America. Dr. Markos has his own family crises, but connecting a long-lost brother and sister becomes a priority. And finally, there’s the other Pari, the daughter who knows she was named after someone special. She’s an artistic American-born Muslim caught between familial duty and the desire for freedom. Her father, Abdullah, is aging and the weight of his care falls solely on her shoulders. The narrative is elegant and compassionate. Despite knowing so little about life in the Middle East, these characters come alive and become people who I love. One doesn’t have to know the terrain of Afghanistan or understand the traditions of Islam to connect with people who are hurting. Yet again, Hosseini created a story that we all should read, if only to realize that we’re all the same inside. If I were rating these book reviews, this one would get five out of five stars. Buy And the Mountains Echoed here.